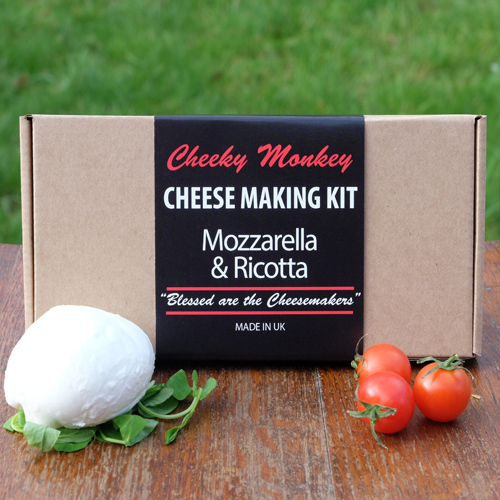 Cheese Making Kit - Mozzarella and Ricotta. It is easier and you think to make your own fresh cheeses. 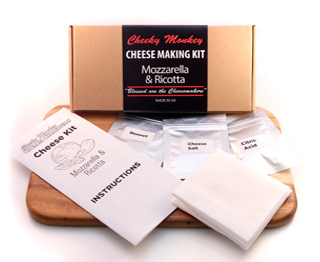 The Cheeky Monkey Cheese Making Kits are simple to use for even absolute beginners.This Kit can make two Italian fresh cheeses Ricotta and Mozzarella. Every kit has enough ingredients (milk not included) to make two kilogrammes of cheese from twenty litres of milk. With the simple, easy to follow instructions it you can be eating your first home made cheese in a very short time. 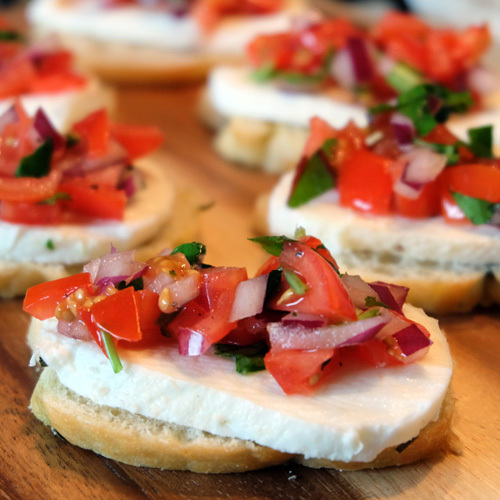 Start making your own mozzarella as soon as the kit arrives and you'll be eating bruscetta with homemade cheese for dinner. 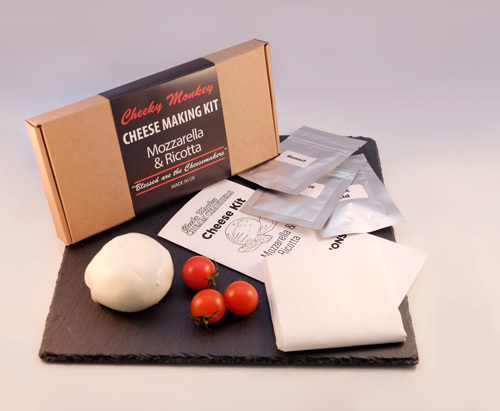 Our cheese kits are vegetarian and contain rennet from vegetable sources. Makes four batches to allow you to try out and then perfect your home cheese making skills. Mozzarella for either melting on home made pizzas or dicing into a fresh salad, just think how impressed your family will be when you tell them that you made the cheese on top of the pizza they're eating. 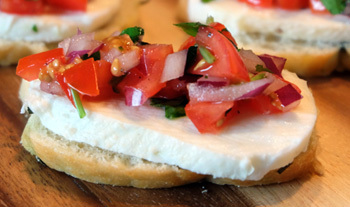 Mozzarella can be eaten fresh or stored for a week in brine. Ricotta is best just smeared over some farmhouse bread and drizzled with some quality olive oil. You can experiment with adding your own herbs to the soft ricotta either hard herbs (oregano, rosemary) or soft (basil, parsley). You home made ricotta can also be used in some simple recipes, baked pasta shells with ricotta and tomatoes, smoked mackerel stuffed with ricotta, fennel and capers. 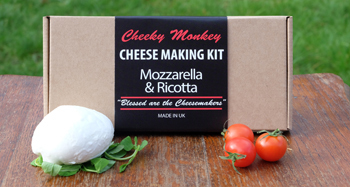 Although these kits are not toys, we think that they are great to be used with children (under supervision) after all, every kid loves pizza – how much will they lobe making their own cheese to go on top of it? 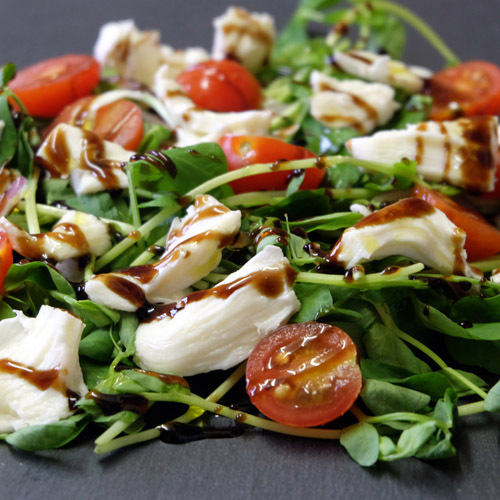 If you wish to be really authentic then you'll want to make buffalo mozzarella, (exactly the same recipe as in our kits but with buffalo milk) we'd really like to hear from you if you know a good place to buy buffalo milk in the UK and we'd like to share that information with our customers. In the meantime then use regular cow's milk, although raw milk makes a better cheese if you can get hold of it any milk will do. Higher fat wholemilk makes a creamier cheese which melts slightly better.